ორიქსი (ლათ. Oryx gazella) — წყვილჩლიქოსანი ძუძუმწოვარი ორიქსების გვარისა. დიდი ზომის ანტილოპაა. გავრცელებულია სამხრეთ აფრიკაში, ძირითადად კალაჰარის უდაბნოში. ზოგიერთი მკვლევარი აღმოსავლეთ აფრიკულ ორიქსს მის ქვესახეობად მიიჩნევს. ორიქსი გამოსახულია ნამიბიის გერბზე. ნამიბიაში მათი საერთო რაოდენობა 373 000 შეადგენს. ↑ National Symbols. gov.na. 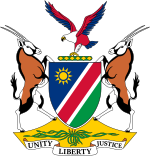 Government of Namibia. წაკითხვის თარიღი: 2015-05-09. ↑ IUCN (International Union for Conservation of Nature) 2008. Oryx gazella. In: IUCN 2015. The IUCN Red List of Threatened Species. Version 2015.2. Archived copy. დაარქივებულია ორიგინალიდან - 2014-06-27. წაკითხვის თარიღი: 2014-06-27. . Downloaded on 14 July 2015.
ეს გვერდი ბოლოს დარედაქტირდა: 18:31, 11 ოქტომბერი 2017.